It is often said that it's in times of crisis when we find out who our true friends are, and sometimes the realisation is a surprising one. I can think of times in my life when I've needed people and the very people who I thought would have my back, suddenly and inexplicably, were not there for me in my time of need. It's a gutting realisation. Been there? Paul had. Paul, one of the greatest men of God in the Bible, the guy who took Christianity to the wider world, the guy who wrote most of the New Testament through his letters to the growing church - he too felt that sense of abandonment. He had been arrested and in Roman times you would have a court appearance before the judge; respectable friends and family would appear as character witnesses or give supporting statements to fight your case. Paul is up against the death penalty and no one showed up to fight his case for him. Imagine how he felt in that moment when witnesses were called and no one was there to persuade the judge that his life should be spared. We don't know why no one came. I can imagine they were scared to be seen to be supporting Paul - I mean, Christians were being persecuted, would you put your neck on the line? But still, Paul was probably feeling particularly lonely and abandoned that day. BUT firstly, he forgave his friends. And then he put his trust in God. God saved him from certain death - for whatever reason the judge showed him mercy. 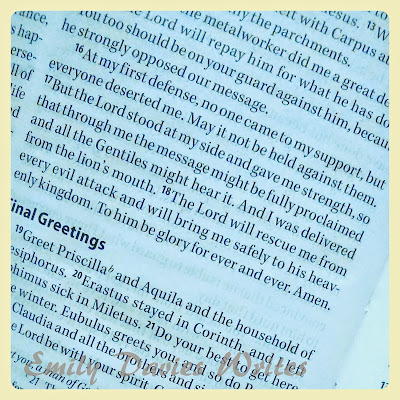 And then Paul declares a promise of God that we can all cling onto during those tough times: "The Lord will deliver me from every evil attack and will bring me safely into his heavenly kingdom." 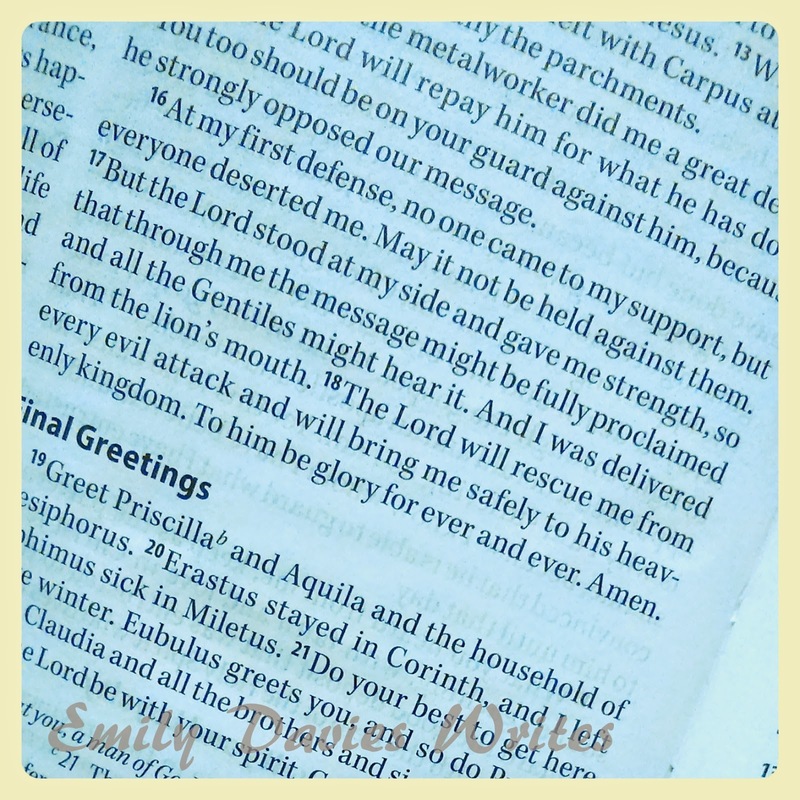 What a promise! See, Paul knew, that whatever the outcome, God would deliver him and then eventually take him safely home. And knowing that allowed him to live his life in freedom - whatever happens God will deliver you, and if the worst happens, God will take you safely home - it's a win win! (Martyrdom isn't necessarily an imminent danger for us, but it was for Paul and it is for many Christians the world over today - are we living in the freedom of this promise though? ).